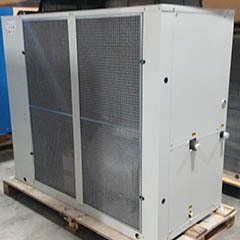 Condenser Panels Provide Stable Efficient Operation All Year Round. 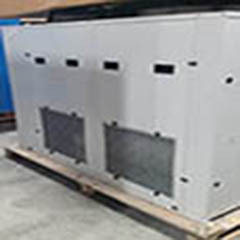 Purestream is pleased to offer the “Made for Canada” Winter Condenser Panel for our CWT Process cooling chillers. The Panel restricts airflow to the Condenser Coils and reduces wind effect under Winter Cooling Conditions. The system works in conjunction with the Condenser Fan Motors to control fan speed and thus Head Pressure. Typically a Field Manufactured “ Sheet metal Wind Baffle” is installed but is often left in place throughout the summer when the condenser needs maximum airflow which can lower heat transfer efficiencies. Purestream makes it easier and no drilling into the weatherproof panels. They also look great and are finished in the same quality as the unit casing. The NEW range of PURESTREAM ACT ES and ACT VS Energy Saving dryers are now available for the energy conscious user. This new range comes from the need to match precision compressed air drying with energy saving features. The new range uses the design characteristics of the PURESTREAM ACT series, which is already well recognized by the compressed air industry. By adding new technological components along with a modified design, the end result is reduced electrical consumption resulting in lower operating costs. Both the ACT-ES Energy Saving Cycling Dryer and ACT-VS Energy Saving Variable Speed Dryer brochures are now available for viewing on our products page. 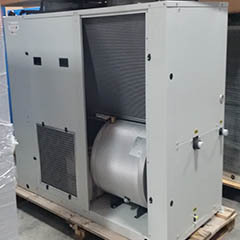 The CWM, CWT, and other Purestream Chiller models are specifically designed to meet the stringent cooling requirements of today’s advanced equipment and processes. The CWM, CWT and other available models provides precise temperature control of chilled water temperature while operating over long periods of time with varying load demands for many industries and applications. All units are equipped with the necessary components to provide safe, reliable and energy saving operation. Also available CWB and CWE models.